EmployABILITY is the ability to create and sustain meaningful work across the career lifespan. This is a developmental process which students need to learn before they graduate. What is the employABILITY Initiative? The Developing EmployABILITY Initiative is a collaboration involving over 30 higher education institutions and over 700 scholars internationally. Our goal is to enable and embed employABILITY thinking in the curriculum. The Initiative is led by Professor Dawn Bennett at Curtin University. New collaborators are always welcome. To find out more, view our introductory slide deck. Prompts students to understand why they think the way they think, how to critique and learn the unfamiliar, and how their values, beliefs and assumptions can inform and be informed by their learning, lives and careers. Self-assessment of learner and graduate skills and attributes (Coetzee, 2014; Smith, Ferns and Russell, 2014). 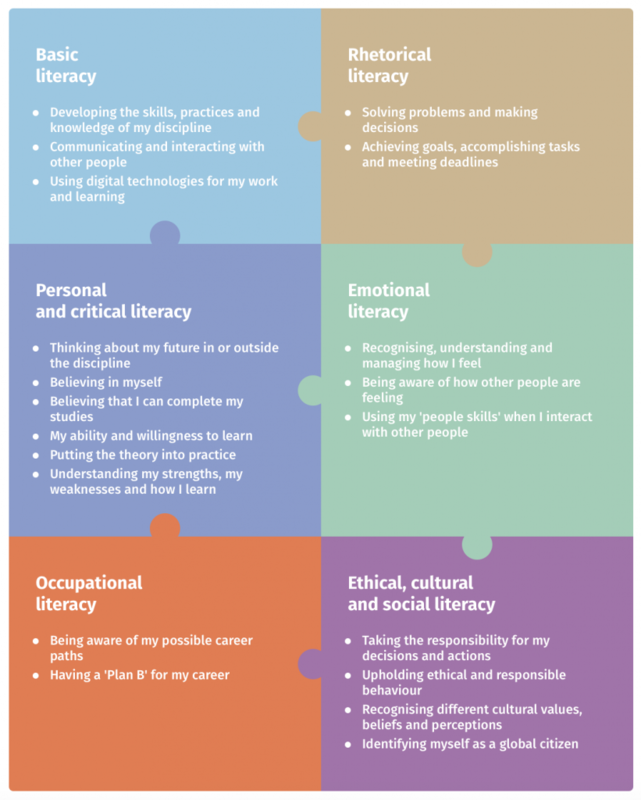 Students view the model as six, inter-related jigsaw pieces and they learn that employABILITY thinking is a continual process that persists throughout the career lifespan. You can see the student view here. Employability thinking isn’t something that is ‘done’ to students; it needs to be explicit and it needs to create cognitive links. This is where the thinking comes in. Every student should engage in employability thinking. This can be achieved through careful scaffolding of work-integrated-learning (WIL), through reflective and assessment tasks that include a future-oriented dimension, and through pedagogical approaches that develop students’ metacognition. When completing the personalised profile tool, students choose whether or not to include their anonymised responses in the research database. The database is hosted securely and all institutional, program and personal details are removed prior to analysis. The consent and information form can be accessed here. How do I start the employABILITY process? The 6-step process is easy to follow and easy to start. Click here to get started. Once you’ve reviewed the 6-step process, information on the Student Starter kit and the employABILITY profile tool can be found here.